Laverne Waddington: born in India, raised in Australia and now living in South America. I have been here since 1993. I spent the first five years in the southernmost city on the South American continent – a wild and windy place called Punta Arenas. 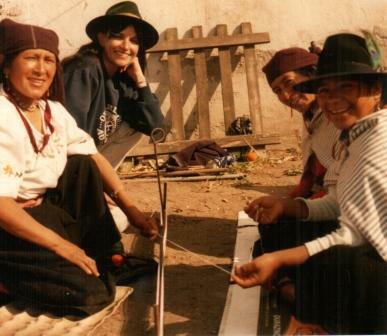 My winters were spent backpacking around Peru and Bolivia learning to weave with indigenous teachers. 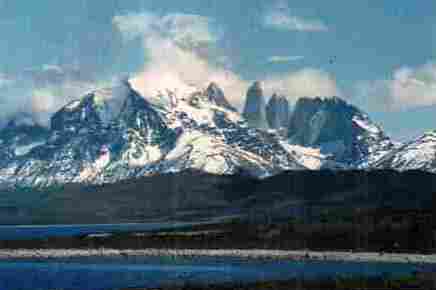 The beautiful long summer days allowed me to explore Tierra del Fuego and the spectacular parks, fjords and glaciers of southern Chile. And, between seasons, I taught English to private students and wove. In 1998, I moved to Santa Cruz in land-locked Bolivia – a large city with a small town feel. Life here is simple and laid back despite the crazy traffic and the blaring tropical rhythms. Quite a change from Punta Arenas with its whistling wind and tossing seas. It was an interesting change of scene and climate but I had no intention of living here. The plan was to stay and work for three to six months in several places before heading home to Australia. Well, I found a great job teaching English here, my students and colleagues were friendly and enthusiastic, I made some friends in my new hostel home, met my ”gaucho” boyfriend and here I am fifteen years later. It is a perfect base from which to travel and continue learning to weave, braid and spin as it shares borders with Brazil, Paraguay, Argentina, Chile and Peru. Since moving here, I have continued to travel and learn to weave beyond the neighboring countries in Ecuador and even further afield in Guatemala. I have kept journals in which I have meticulously documented all the techniques I have learned here over the years with diagrams and step-by-step photos and it is only recently that I have found a forum in which to share all this with other weavers around the world. So welcome to my blog. I hope to be able to tell you all a little about my life here in Santa Cruz and my weaving and learning experiences. But let’s try to make this as interactive as possible-leave comments, ask questions, give me suggestions. I would love to hear from you all. Very interesting reading for curious people like me ! your life sounds very vividly and pulsating … opposite to quiet weaving… just the right counterbalance to get the right balance ? I’d bet you are 50% indian blood, aren’t you ? Seriously, if we don’t share and preserve in concrete form all that we learn from indigenous cultures, it will be lost over time. I have see that happen in cultures in other parts of the world. Also, you may very well, have the most knowledge on this topic to date. Please consider a book. I am so impressed with your clear and simple directions. I am an art teacher (and weaver) who was trying to find simple straight directions on how to make a backstrap loom (for children studying South America). Your wonderful videos and all your instructions have been incredible. Now I just looked on all the photos of your work and I am floored by the depth of knowledge and beautiful work you have. You MUST write a book. Thank you Rena! I am so pleased that you will be able to make use of this with your school children. I have had a lot of requests for a book. I am definitely thinking about it. It is quite inspiring to hear your story. I am starting to plan a trip to learn backstrap weaving in South America. I would love to find good teachers in Peru or Bolivia. How did you find the weavers you learned from? I would love to receive information of who you have learned from, as well. I will email you with some info. saw you at weavolution. i’m curious because i have an american friend who lives? lived? in santa cruz, karina mackinney. lost contact with her and i wonder if you know her. don’t think the american community there is very big. thanks for any leads. I don’t know her but I don’t actually hang out with the foreign community here. There is an American school and I know one of the teachers there and he would be the one to ask. Next time I see him I will. Found you through Ravelry- what a Find! As a new weaver, I find it inspiring to read about such an old craft-no, art. That you have made it such an important part of your life, and that you’re sharing it through your blog, makes me feel privileged even to be scratching the surface of weaving. Hi Laverne, I just found your blog and am enchanted! I am a greenhorn weaver and one of the reasons I started is my love for South American weaving patterns. So far I’ve been weaving some small Navajo rugs and just started learning to use a Dorothy loom. I am planning on trying your tutorials on an inkle loom! Thank you for keeping this blog – I would be most interested in a book if you decide on publishing and would love to help if possible. Hi Laverne it was so lovely meeting you at CNCH last weekend. Somehow a website was in my emails today and when I started looking I saw your name and photograph. My work email address is sally@wildfibersmagazine.com and I would love to stay in touch if you have time occasionally. Looking forward to travelling to Australia May 5th but until then I need to go back to work on the magazine. Have a wonderful trip back to Australia and I will indeed stay in touch with you. It was lovely and surprising to hear that Aussie accent as I was walking about. I really enjoyed our chat. Nice to find your site. I am going to ecuador and want to visit some places to see the ikat. (near Otavalo and Cuenca). Do you have some extra information? I found the Cuenca area to be the best place for ikat although they are not so willing to share their “secrets”-there is a lot of competition amongst the studios there/ Be sure to visit the museum in Gualaceo. If you have a lot of time you may be able to get out to the outlying settlements and find an ikat weaver who is not connected with the bigger studios who will show you the process. Talk to the director of the Gualaceo Museum-his name escapes me now but he has filmed the ikat weavers and done a wonderful job of that. Last month I have been to Ecuador and near Cuenca in Bulcay I found some people ikatweaving. Some I could ask questions and I was allowed to make some pictures. Nowadays they use plastic to tie instead of agave fibers. In Gualaceo I visited the museum (Parador Turista, small but very nice) and spoke to Raul Cabrera. I showed him pictures of my own ikatwork. Hi Laverne. My name is Sam and I am in the process of applying for a grant to study different weaving techniques around the world. If you get a chance, I would love to exchange emails with you and get advice about where to go and whom to contact. I will email you as I am happy to help out in any way I can. Well, I am plugging away at my attempt to learn to weave. I have just finished the backstrap and am about to try something else. I am still having problems with setting up the warp and keeping the warps straight. Mine seem to get all over the place. Hopefully that will improve with practice. I am considering approaching one of the women who sit on our plaza and weave in Ajijic to get some help. I was also wondering if you happen to know any teachers in the Chiapis area of Mexico around San Cristobal? We are hoping to spend October and November there and I thought that this might be a good time to get in some lessons. Your tutorials are wonderful, but I think I might benefit from some hands on teaching. I have never been to Mexico!! I imagine that if I go there I will not be seen for months and months!! I am sure that you won’t have any problem finding a teacher there. I am still not quite sure about what you mean when you say that your warps go all over the place. The cross sticks should keep he warps in order. One thing you could do on top of that is to use a length of yarn to chain around your warp threads as you wind the warp. You chain every 10 warps or so. That will really keep the entire length of the warp in order. Thank you that is a good suggestion. What seems to happen is that when I move my warps onto the loom bars the warps seem to tangle and get twisted. They are straight at the cross, but are not the same at the loom bars. Last time I resorted to using scotch tape to tape the warps in place before I moved them. That seemed to help. I thought I had read somewhere that you had been to Oaxaca, but I must have been wrong. I know a few people connected to the Mayan community and maybe they will be able to help me find a teacher in Chiapis. I plan on taking Spanish classes which I keep doing on an ongoing basis, painting in plein air and weaving classes. That should make for a busy 2 months. The chaining will help keep the warps somewhat straight at the loom bars but they will always cross to some extent. You need to lift and place them in position yourself if you want a really nice smooth start. A lot of the time people have fringe at the start so the twisting there does not matter at all and after the first few weft passes the warps will start to straighten themselves out. My teacher in Guatemala would lift each and every warp up on a pointed stick and lay it in its correct position on the loom bar. The time and care she took was worth it. Thank you, that is really good to know. I loved your work. I myself do Fléché (Finger weaving), weaving on loom, spinning and other fibre related work. You have been a great source of inspiration and when I saw you had a book, I couldn’t resist but was debating between the paper back book or the ebook. I finally decided on the ebook. I purchased it last weekend but I’m still waiting for the pdf. THank you for ordering my e-book and I am sorry that you have not yet received the link to download it. I will contact WeaveZine about that immediately and I am sure that this will be resolved soon. I did finger weaving many years ago and enjoyed it very much especially the Peruvian bands. Do you have pictures any place on the net where I could see your work? thanks for looking after the missing ebook. I have received the PDF via “YouSendIt”. I love it. Great manual Laverne! I’ve been following you on the blog since I discovered your Flickr pictures last Fall. I love traveling and exploring various weaving techniques from around the world. I just completed a Fléché piece for a friend. I will take pictures and send them to you via email. Eager to see your glossy photo book on all your work. Glad it all worked out. I am sure you must have some interesting travel tales too. I look forward to seeing the photo of your latest finger weaving piece! I will be in Cochabamba from the end of October through mid-January working with Performing Life. I would like to know more about the indigenous weaving community in that region. Do you have contacts to recommend or locations where one can encounter the master weavers there? I can put you in contact with someone who is already working with weavers there. She won’t be there in early November as we are all going to a weaving conference in Cusco but that will be only for a few days. I’ll email you. First of all, thanks SO much for such a beautiful and detailed website. I’ve been wanting to learn backstrap weaving for many years, since I saw the beautiful textiles my great-grandmothers made back home in Mexico. I don’t know of any in the Bay area which doesn’t mean that there aren’t any. I will email you with some info about some of my friends who are more or less in your neck of the woods. I am looking for two woven belts in muted colors for my home. I have a number of them already, but I need two more. I need size to be about 100 inches by 2 inches wide. Can you put me in touch with a vendor? Or can you help. I will email you and put you in contact with a possible vendor. Hi Laverne, I am so happy that I happened onto your website. I am in the midst of learning card weaving and I came across your website. I finished my card weaving project and began instantly to gather the materials for my loom. All of which I had already in my garage, short of broom handles. I went to work the next day and came home with a bountiful supply of used broom handles. Now I am starting to go through your lesson plan. I have warped for my backstrap. I am so excited. On your Faq Index #13 , 14, 15 through the end of the list don’t link to anything. Is that because you are not done? Your attention to detail on your blog and tutorials are awe inspiring. I look forward to reading updates every day and check for new posts several times a day. I am glad you are enjoying the site. The FAQ index is a work in progress! I just added number 12 last week. I need to take photos for some of the last ones and that is something I do little by little. The main posts come out once a week. If I am traveling as I am now they can be less frequent. I add little details behind the scenes now and then. I look forward to seeing how you go with your backstrap loom. I hope you found the link to the WeaveZine article as that will help you a lot. Hey Laverne, I’m in a bit of a pinch. My wife is experienced in all forms of fibers (spinning, knitting, etc…….all the usuals) and she’s been wanting to give a go at weaving. She’s mentioned backstrap looms in passing. I’m confident that she’ll be able to pick this up without too much trouble. So…..now it’s Christmas time and I was thinking about making a backstrap loom (as well as a book) for her. I’m pretty handy with woodworking and it looks fairly straightforward. I was wonder about the actual width of the loom though. I think my wife is interested in tapestry-sized wall hangings. It seems like all of the looms I’ve seen are in the 6″ wide range. Would 12″ be too unwieldy? I’m assuming the width of the final product is limited by the loom width (correct me if I’m wrong). 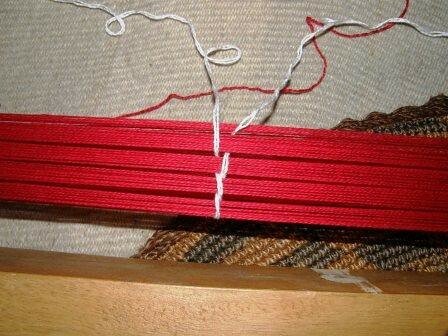 I guess what I’m wondering is…….is there an advantage to using a narrower loom as opposed to a wider one? My loom is 19″ wide and I use it for everything even down to the tiniest bands. Although some people say that that is overkill, I am very comfortable using this loom for such small projects. So, no, 12″ would not be unwieldly. In fact, I would recommend making something at least 14″ wide especially if your wife is interested in making wall hangings. I find that the backstrap sits more comfortably on the loom bars when they are wider. She should, however, start off with narrow projects to get started and best to start with plain weave until she gets the hang of things. I don’t know if you have seen my article called Backstrap Basics on WeaveZine. This gives details about good introductory projects and also shows the loom parts. Dear Laverne: While I was browsing this site, I found your stepmother asked you to weave in quechua: work, don’t steal… could you send me back the link??? I’m argentinian physics teacher and work in school in the middle of a bolivian quarter in Escobar town, state of buenos aires. I want to make some kind of wallhanging in felting technique. There’s a lot of self discrimination in our school comunity, it would be nice to recognize their origin and traditions…. I am really enjoying your blog! Thanks for all the effort that you put in! I will email you Warren. This is a huge question and it is I who doesn’t know where to start! I could be here all day. My suggestion for now is to read…go to the library and get hold of as many books on Peru and Bolivia as you can, read websites etc. Then, if you have more specific questions come back and ask. Hi Stephanie. I do have a suggestion for Bolivia and I will email you with details. I am still weaving after our time together. Have started a couple of the patterns from the Cahlander book, and am stretching out the width and length little by little. Thanks for that great link. i will share it in my blog post next week. I am so pleased that you are weaving. Are you going to join Pam’s study group? I will be back in October and hope to see you then. In the meantime I hope you will send me pictures of what you weave. Ask Pam for my email address. i’m a fashion designer from Egypt….been searching on th net for ethnic art and found ur web site…..i am amazed by back strap weaving….plzzzzzzzzzzzzzzzzzzzz i would love to learn…..i don’t have the tools …..is it possible to purchase them online? Can you teach me……? Hi My Dear Teacher Laverne !! I would like to ask two questions to you: First, may I use your designs to wave some bracelets and small nack bags and sell them? I can’t do this without your permission. Than, when I need may I writte and ask you? Or, if I writte and ask, do you bore? You can write and ask questions any time. I may not be able to answer them all and sometimes I may not answer right away but I like having people write with questions as it helps me see what things I need to add to my FAQ section. About using my designs, I will write to you by email, okay? I would like to see pictures of what you are doing some day and your spinning as well. I am looking forward for your message. I willingly take photos and send to your mail adress when I know. we are currently travelling through Ecuador and we have stumbled upon your sight while doing research into Indigenous textiles and weaving. Your site is amazing with endless information so we were hoping you could help us a little. We would love any information you could share with us on Indigenous communities around Quito where we might be able to visit and learn first hand how to weave and potentially purchase textiles also. We will be around the area for the next couple of weeks. Ecuador! Lucky you. 🙂 I’ll email you guys tomorrow. Just had to write and say THANK YOU for all your wonderful tutorials, videos etc. I took a four hour workshop on bs weaving last spring and became intrigued with it. I found your blog, made a back strap and tried to make a few patterns, without much luck until recently. A friend gave me some mercerized cotton from her stash and it was just perfect for experimenting with your book. Up until then I had been using very fine crochet cotton that the instructor had recommended. This bigger cotton was about 15 wpi and I’m just thrilled with the results. I bought your Andean pebble weave book and I’m hooked!! Thank you again. I sure appreciate your blog and all. Hi Lynda. Thank you so much for writing and I am so happy that you are enjoying my book and have found the yarn that works for you. I hope you will send me pictures some time of the pebble weave bands you are making and I hope that you try some the tutorials here on the blog again in the future. I’ve buy last year your e-book. In english…and I’m speaking french… I see that you have now the same in french, is it possible to receive a copy in french ? I know and read the the french forum”Tricofolk” and I hope it is possible ! The French version is not yet ready to sell, Marie. Sandrine, whom you must know from Tricofolk, is giving it the final check. I will let everyone know when it is ready. I have been trying to understand string heddles for over a year now. you are the only person on the web who has bothered to show them in detail. As an instructor you are beyond awesome. Now I can begin start weaving again. Well, thank you! I am glad you found the tutorial helpful. I found your site while looking for some weaving classes in Bolivia. And all your information is fantastic, but I would still be interested in learning from someone. Can you possible give me any infromation about where there are classes? I am at the moment in Peru but will be in Bolivia someday in the next days. Hi. I don’t know of any organized places to learn like the ones you have probably found in the Cusco area. You could try contacting Dorinda Dutcher through the PAZA Bolivia website. Dorinda works with weavers in a cooperative in the Cochabamba area and welcomes travelers to stay and volunteer while learning to weave. She does not have regular online access so you may have to wait a while for her reply. And thanks for all the info on your site!! I was interested in buying a andean sling magarita pattern, is there any place online to buy these? I have a friend in Australia who found a way to buy slings online. I am not sure if they had the Margarita pattern but I shall ask him and let you know. Another question! I am finally weaving a wider piece of plain striped warp, and I want to make a change purse from it. How do I make the sides so the purse has some depth? I think I’ll put a piece of metal tape measure to open and close it. Thanks for your help….again!! Keep it coming. Just love everything on your site. You could weave a narrow band and sew that along one side then along the bottom (on the inside of the purse) and back up the other side. That will also give it a bit of a flat bottom. I hope that helps. I love your tutorials so much. I had been using a rigid heddle with a backstrap loom, and I’ve had no problem making string heddles, but this is the first I’ve done continuous warp, and I have a question: my warp strings seem to get twisted once I take the warp rods off the warping pegs, and I’ve had a hard time straightening them out. Any advice? The warps threads shouldn’t get twisted as long as you have cross sticks holding the cross but I think I know what you mean…the warps bunch up and re-position themselves one on top of the other. I always try to keep the warp as undisturbed as possible when taking it off the stakes. I try to lift it off keeping it as flat as possible so everything doesn’t end up in a bunch. I often insert the loom bars into the warps ends while the warp is still on the warping board and lift it off that way straight onto the loom. Once the warp is on the loom bars you will have to straighten things out, lifting each thread and settling it into position.It’s just part of the process. One thing that can help is chaining thread around groups of warp ends as you wind. That helps any major bunching and crossing over while you lift the warp off the stakes. i recently found your blog and I love it! Thank you for taking time to share all this wonderful information. I am currently living in Ecuador (near Santa Elena, in the peninsula) and I would love to be able to find some people who weave here, perhaps learn a bit from them, find supplies, etc. Do you have any recommendations? I might be getting up to the Quito area sometime, so if you know any locations near there, that would be great, too. Thanks again for sharing your passion. It’s always inspiring to see someone who really loves what they are doing and who is always learning more. I am sorry but I don’t know any weavers on the peninsula. I can only recommend asking around, especially in museums. You may find stores that sell supplies for horses and mules….saddles and that sort thing…they quite often carry the woven saddle bags and you could ask them to put you in contact with their supplier. Look for heavy cotton hammocks in the street market and ask for the supplier. Of course explain that you want to learn to weave otherwise they won’t want to tell you anything thinking that you just want to get a better price by buying form the weavers directly. If you are heading to Quito then it is just a short trip to Otavalo where you will have the chance to be with plenty of weavers. Good luck! I purchased two “antique quilt racks”…which my quilting friends and I knew were NOT quilt racks. But the two peices were so beautiful with wonderful carvings!!!! Have been researching on the internet to solve the mystery. We knew they were loom parts as we recognized the reeds, but we were only familiar with a table loom. Saw your blog with the picture of the Thai reed loom you were given as a gift and was thrilled!!! What I have are two Thai reed backstrap looms! They are identical to yours, except in size. They are 39 inches wide and 8 inches tall. I had planned to use them to display antique laces and baby clothes that I have, now I may have to learn to weave!!!! This is such a unique loom! I have never seen anything like it…so lovely! Thank You for posting the picture!! Hello Laverne, I am just starting to weav on a inkle loom. I have never woven on a loom before, well I have never woven at all. And I am so happy to have found your site. It is a great site. I can learn a lot from your site. Thanks. It is a beautiful site. Hello Elisabeth. Thank you for your comments and welcome to weaving! I would like to thank you for our wonderful work and information you are giving on your website about weaving. I am fashion designer and at this time looking for supply of similar design fabric like Navajo rugs or blankets.I preferred from Peru,Bolivia Ecuador or Guatemala. If you have any Information about vendors or factory that can supply me please let me know. Met you at the Textile Museum Indian craft event and would love to take a class with you! I recently got interested in weaving and your blog is constantly coming up in all my searches. I made my own backstrap loom after seeing the prices on other types of looms. After my first project I almost gave up on it (tried doing a weft faced weave and my warps wouldn’t stay spaced correctly). I realized I was starting on something a little too hard so I just did a plain warp faced weave in one color. I’m in love with it now and I plan to keep weaving with it. I absolutely love that I can take it places with me and I feel most comfortable using my feet to hold the end warp bar for tension. Anyway, I just wanted to say thank you for all this information you took the time to compile for people like me. If your blog wasn’t here I’m not sure I could have figured it all out. excelente tu blog!!!! soy argentina y lamentablemente aqui no logramos poder aprender todo esto que tú generosamente has trasmitido GRACIAS!!!!!! ESTOY MUY FELIZ DE PODER INTENTAR APRENDER ESTO DE LAS CULTURAS ORIGINARIAS!!!! MIS RESPETOS Y ADMIRACIÓN ! I love your blog! I am starting my round the world travels this summer and I hope to travel around peru, chile and the andes and I want to learn to weave. I studied art and art history in school and I would love to travel the world learning arts and crafts. How did you find the women you worked with? Did you need to learn a dialect or did spanish get you around? Thanks for your comments. I got around just fine speaking Spanish. When I worked with my teachers I picked up a few phrases in Quechua…greetings and things like that. Even if my teacher only spoke Quechua, which was rare, there would be someone else in the family who had a good command of Spanish. But, to tell the truth, it didn’t make much dfference as my teachers did not teach by explanation…they wove and I watched. I have found my teachers in many different ways and through different resources. Sometimes I have found them through a local cooperative but, most often, I would simply go to a town and tell everyone I met that I was looking for a teacher. I would go to the market with examples of my own weaving and talk with the ladies who sold the spindles. Eventually a teacher would be found. Some places are more geared to teaching foreigners and have quite formal set-ups for this. In Cusco, Peru you can easily arrange classes and you may even get a teacher who speaks some English who will teach you with explanations, pattern charts and everything that weavers are used to having in a workshop in the west. I have been enjoying your tutorials and passionate sharing of all these beautiful people, pieces and skills. I am not much of a weaver, but I love even dabbling in it. A few years ago, while I was at the Maryland Sheep and Wool Festival, I saw a purse from Peru that took my heart. But when I returned from asking a sales person more about it, someone else was purchasing it! I at least had the presence of mind to ask the purchaser for permission to photograph it, and she kindly consented. The knitting (and perhaps crocheting of the flap edge) seems to be straight forward enough, but the strap is a mystery to me. I called the people who were selling it and they said it was braided on toes and fingers in a most complicated way. My first impression was that it was card woven, but I am no longer convinced. I have yet to try to duplicate it with card weaving. Then I came across your blog with the descriptions of the Ñawi Awapa, and thought it might be that, but I still wonder. It does not seem to have the same structure. I would like to send you the one photo I have of the strap (and bag). If you would look at it, would you please let me know how I may attach this jpeg file? Thank you. I would be very grateful to you for looking at it and letting me know how you think it was made, and – if possible – how to make it! I saw something that reminded me of it on your blog, a Bolivian amulet bag with a wonderful strap. Would you be able to tell me more about that strap, as well. Thank you so much, Laverne, for all you share, and for looking at this. My wife and I will be vacationing soon in Peru and I am looking forward to exploring weaving around Cuzco. Sorry we are not headed to Bolivia or I would definitely look you up. Can you offer any suggestions for while we’re in Peru? The Centro de Textiles Tradicionales del Cusco sounds like a great place to start. Do you ever vacation in the US or come to the US to lead weaving workshops? If so, please let us all know! I have really enjoyed your blog! I came across it while researching weaving in South America. I am 27, living in Brooklyn NY as an printmaker and sculptor–pursuing an interest in weaving and knitting which I have spent the last year studying independently. I am flying to Ecuador in January and spending 3 months traveling around Ecuador, Peru and Bolivia. I am wondering if you will be around? Or if you have any recommendations for working with or learning from any craftsmen or artists while I am there. Dear Laverne Waddington, I really want to say that my wife and i are really happy to meet your blog and you (but ofcourse not face to face, one day why not?) We have learnt lots of things and are still learning new things from your blog. We want to thank you! Have a great weaving! I am curious if you accept commissions for custom projects? I was looking for a poncho to be woven. Hi Karen. I have sent you an email in reply to your request. Just letting you know that I replied to your message by email. I heard of you from a friend from Morisset Hand Spinners and Weavers, NSW, who is passionate about weaving and have loved looking at your blog and videos. I’d like to organise some backstrap-weaving workshops. Would you be interested in teaching us? Thanks for writing to me. I have just sent you an email. You might check your junk mail file just in case it goes there. Hi Laverne: Have been trying to buy your downloadable book, on Complementary Pick-up through Patternfish.com. The link to pay-pal is not working!! Loved your class at ANWG, but I think that the book will refresh my memory! Jen PS Any suggestions as to why Paypal is not loading? Hi Jen. Thanks for trying to buy my book. Sorry you are having problems. I just went over to the Patternfish site and went through the process to buy one of my books and Paypal loaded just fine…no problems whatsoever. All I can suggest is keep trying. It might be just a temporary glitch. If you don’t have success, shoot an email to patternfish support. Let me know how it goes. Thanks for quick reply, Laverne. I have already sent an e-mail to pattern fish support, but nothing back, so far! Maybe wait an hour and try Paypal again. I just tried again and got through to Paypal no problem. Perhaps you will get a reply from patternfish in the meantime. you are the answer to a wish in my heart: the eye pattern ebook! hooray! i have seen pictures and references to it, and tried to figure it out, but it’s tricky. now i have your new book and can’t wait to get busy with it. you are such a generous resource, i love your books, and i thank you so much. this is starting out to be a very good year! Aweome! It’s always lovely to find people who are so into this. I know you will enjoy this technique! Thank you, so much, for your eye pattern ebook. It is a great instructional tool. The pictures are so helpful and your written directions are very clear, too. I especially appreciated that you included a “short hand” form for weavers to use once they have made some progress with the technique. I am an educator and I am especially appreciative of how you were able to anticipate mistakes / challenges and to encourage people new to this technique. I am so glad you are enjoying the book, Marya. Thank you for taking the time to leave this lovely comment.